As the day started off rainy and cold, coffee and chocolate would be the perfect way to make a rainy day better. No traffic on the way there. Got a great parking space. The rain stopped for a few moments while we got out of the truck and went inside. I had my older daughter with me and we headed straight for the bakery. We circled the bakery 4 times before finally asking one of the bakery ladies “where’s the demo for the Starbucks Coffee?” They looked at me like I was crazy but were very kind and helpful. They had no idea about any demo, so I asked about the muffins. There were substitutions I could have made if the Double Chocolate Muffins weren’t available but I really wanted those muffins. The shelves were almost bare. But then I saw it, the one package of Double Chocolate Muffins! It was like the rain stopping again! We still had to find the coffee demo and then I remembered, most of the demos in my Walmart happen along the refrigerated section. On down the isle we went and the only demo going on was for Starbucks Coffee! Just the demo stand, A pot of coffee and a few bags of Starbucks Coffee. The sweetest girl had just finished brewing a fresh pot. Such tiny cute cups! We had our sample which honestly I wish I could have just taken the pot instead of the little cup. The demo girl did offer us a second cup but since I knew I’d soon being going home and brewing my own pot, I decided to be nice and leave some coffee for the other shoppers. The coffee isle was well stocked. We grab our coffee and head over to look at shoes. Yes, anytime we’re in a store that sells shoes, we go look. Summer is just around the corner and there might be a cute pair of sandals we just have to have. And there was a cute pair but not in my size. The rain held off and the sun even showed itself for a few minutes. At home, opening my bag of coffee, the smell of the fresh ground coffee, then the aroma while brewing. I didn’t have to tell hubby I was back. The freshly brewed coffee called to him, leading him by the nose to a fresh cup of coffee in the afternoon. Darn that coffee! He saw the muffins too! I had to share. The Double Chocolate Muffins were so moist and fresh. The coffee was delicious. What was so surprising was the flavors when paired together. The coffee was I little more chocolaty, the muffin a little richer. The hubby and I enjoyed a little quiet time in the middle of a Saturday thanks to a Delicious Pairing. I am a member of the Collective Bias® Social Fabric® Community. This shop has been compensated as part of a social shopper insights study for Collective Bias™. #cbias #SocialFabric All Opinions are my own. What a delicious treat! 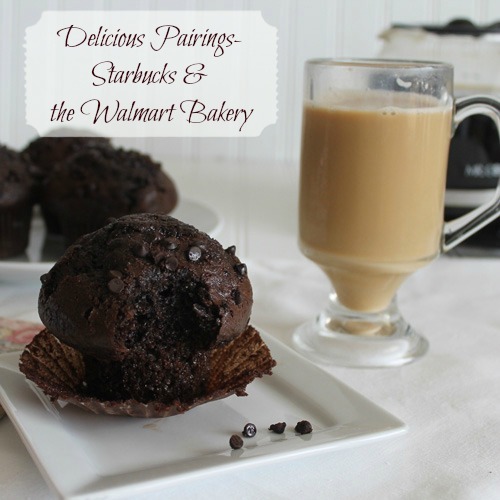 Both the muffins and coffee look yummy!! Yum!! What a fun way to celebrate chocolate week! !